Now I don't know about you, but my desk can become quite messy and cluttered. Which is why this empty Neom tumbler has come in so handy. It's now a desk tidy, and houses my daily essentials (namely hand cream and lip balm), both of which can be found at a moment's notice. Previously, they'd get caught up in all my paperwork and it would take me a good few minutes to locate the items. Some candles are beautifully decorated (eg. Elemis royal candle), and once cleaned out, they'd be perfect as a make up brush holder. My Noble Isle candle came with it's own lid, and once I've finished burning it, I plan to put it to good use as a storage pot for cotton wool pads. Smaller glass tumbers have come in incredibly handy too. My empty Apivita candle is the perfect size for housing all my hair clips, and I've got another glass tumbler on my desk which holds odds and ends such as superglue, name badges and elastic bands. Do you have a favourite scented candle? What do you do with your empty candle glasses? Not at all, I was actually going to mention it in my blog post but decided against it as I didn't want it to be too long. That's such a good idea! Weirdly, I use the box that my Calvin Klein candle came in to store all of my hair bobbles as they seem to go astray so easily! 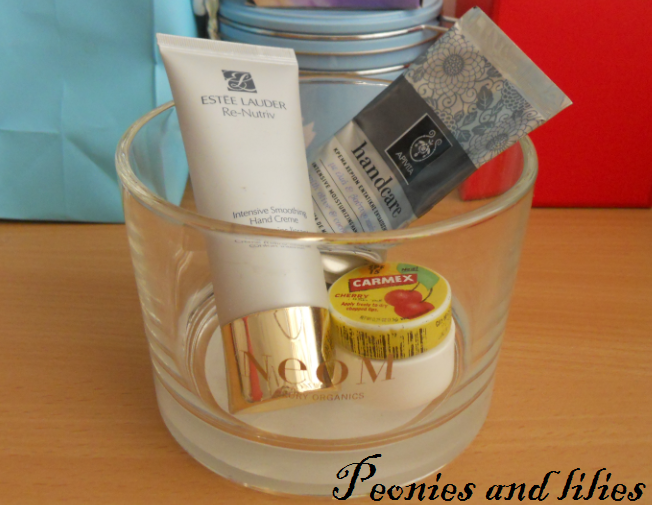 I currently have 4 on various places: 2 in the bathroom (one for toothbrushes and toothpastes, the other for my makeup brushes), one on my desk as a pen holder and a last one near my makeup storage to hold products I'm trying to use up! Would love on with a lid, though, like the one you have! Hmm, that's sth to look into when getting a new candle, lol!